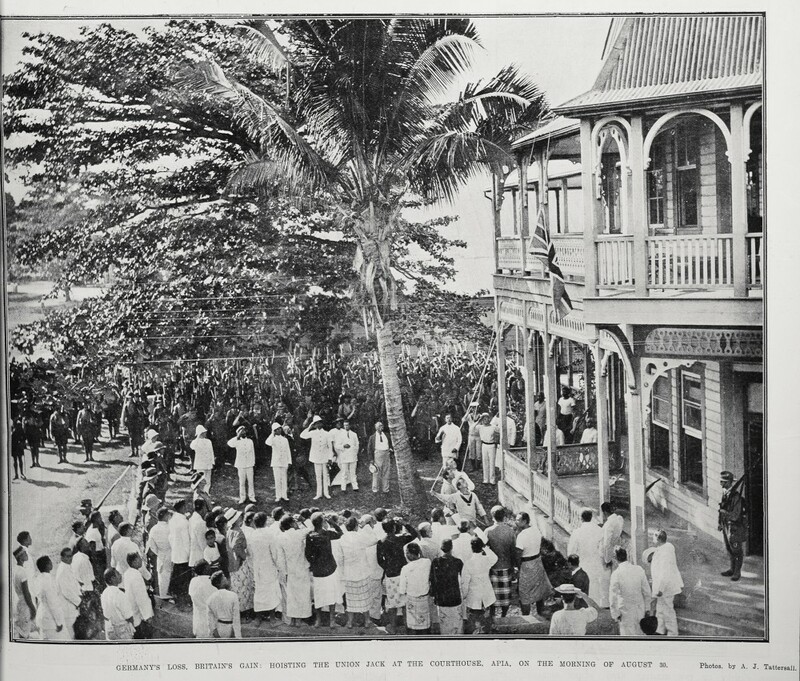 Soon after the start of the First World War, New Zealand’s Governor Lord Liverpool agreed to send New Zealand troops to capture the German wireless station in Samoa and occupy the German colony. 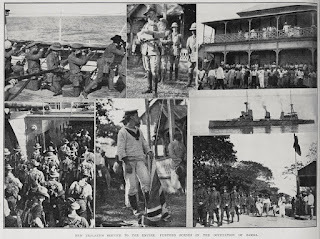 New Zealand troops, supported by three New Zealand cruisers and three other Australian and French warships, took possession of German Samoa on 29th August 1914. Ref: Auckland Weekly News, The British occupation of Samoa, 29 August 1914, Sir George Grey Special Collections, Auckland Libraries, AWNS-19140917-42-1. Ref: Auckland Weekly News, The unopposed landing of the New Zealanders in Samoa, 7 September 1914, Sir George Grey Special Collections, Auckland Libraries, AWNS-19140917-43-1. Ref: Auckland Weekly News, New Zealand’s seizure of Samoa, 24 September 1914, Sir George Grey Special Collections, Auckland Libraries AWNS-19140924-36-4. New Zealand’s capture of German Samoa was recorded by resident photographer and former Aucklander Alfred John Tattersall. Some of these photographs were published by the Auckland Weekly News and are available to browse online through Heritage Images. You can find out more about Tattersall through the Photographers database (simply type in Tattersall, Alfred into the search box). Ref: AJ Tattersall for the Auckland Weekly News, Germany’s loss, Britain’s gain, 30 August 1914, Sir George Grey Special Collections, Auckland Libraries, AWNS-19140917-43-2. Ref: Auckland Weekly News, New Zealand’s service to the Empire, 17 September 1914, Sir George Grey Special Collections, Auckland Libraries, AWNS-19140917-46-2. After the New Zealand troops had established themselves, the New Zealand cruisers and transports returned to Auckland, carrying the German Governor who was to be interned in New Zealand. Likewise the Australian and French warships sailed off to support the Australian invasion of German New Guinea. But it was not long before the small New Zealand force in Samoa received a nasty surprise. 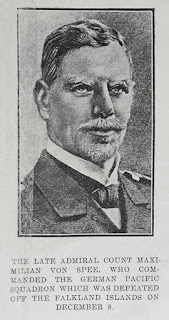 Ref: Auckland Weekly News, The late Admiral Count Maximilian von Spee, 18 February 1915, Sir George Grey Special Collections, Auckland Libraries, AWNS-19150218-44-1. German Admiral von Spee planned a raiding campaign against Allied commercial shipping in the Pacific. When he heard about the New Zealand occupation of Samoa, he thought his warships might be able to catch the powerful Australian battleship HMAS Australia in Apia Harbour, where the ship would not have much room to manoeuvre. 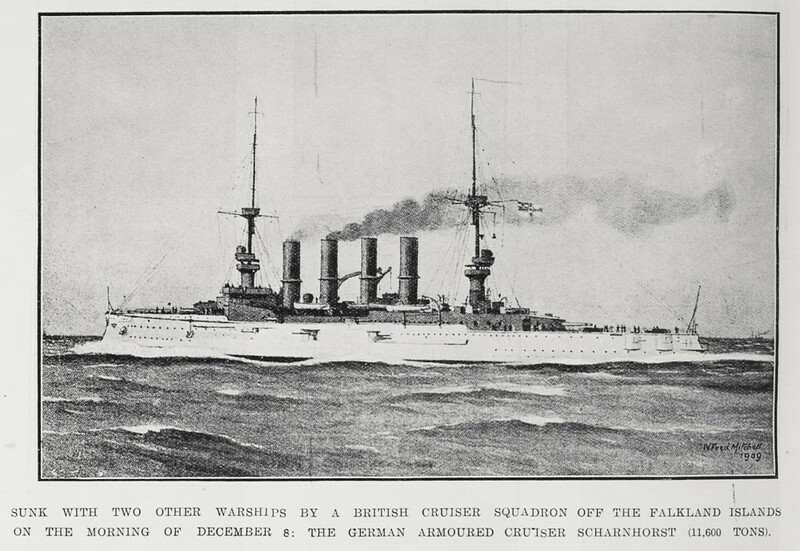 So he ordered SMS Scharnhorst and SMS Gneisenau to head south for Samoa. Ref: AJ Tattersall for the Auckland Weekly News, When Apia belonged to Germany, 22 October 1914, Sir George Grey Special Collections, Auckland Libraries, AWNS-19141022-36-2. On Monday morning 14 September 1914 the New Zealand lookout posted at the top of the Apia radio mast saw two large warships steaming towards Samoa. They were quickly identified as Scharnhorst and Gneisenau. 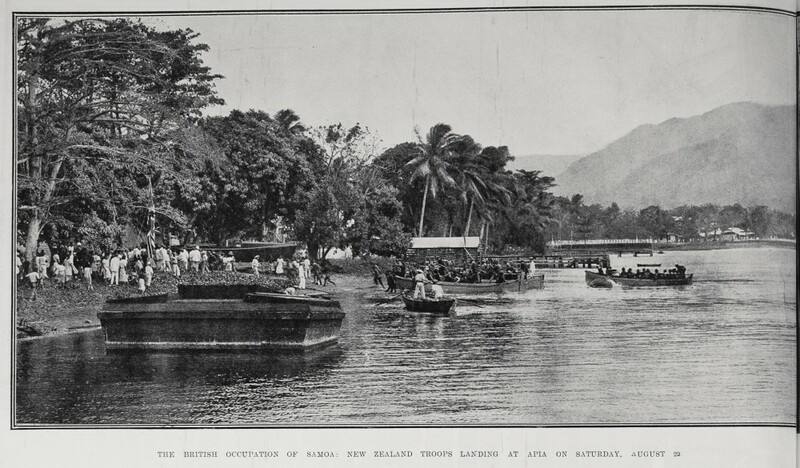 The warships reached Apia Harbour while the New Zealand soldiers were having their breakfast. Quickly, the troops ran to the shore. Two platoons of the 5th Wellington Regiment marched across the Vaisigano Bridge (in Apia Harbour) while the Gneisenau trained its guns on them. Fortunately for the New Zealanders, the Germans did not open fire. Although the warships could have machine gunned the New Zealanders on shore they did not do so. The New Zealanders deployed expecting the Germans to land. However, unbeknownst to them the Germans did not have enough man or small landing boats to attempt to recapture Samoa. 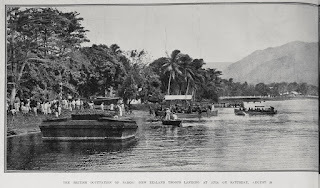 After sitting in the harbour for about 30 minutes the warships sailed down the coast of ‘Upolu to Mulifanua where there were some large German plantations. 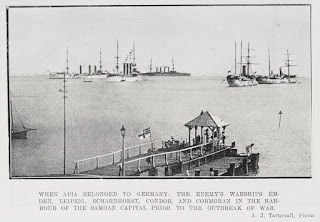 After anchoring near the ferry port, Admiral von Spee asked a German planter to take a taunting message back to the New Zealand commander, Colonel Logan, warning that after his ships had dealt with the Australian cruisers, he would return and take Samoa at his leisure. Ref: Auckland Weekly News, Sunk with two other warships, 17 December 1914, Sir George Grey Special Collections, Auckland Libraries, AWNS-19141217-42-3. Ref: Auckland Weekly News, The Monmouth and Good Hope revenged, 17 December 1914, Sir George Grey Special Collections, Auckland Libraries, AWNS-19141217-42-4. Admiral von Spee sailed north-west from Samoa, stopping his jamming of Apia radio long enough for the New Zealanders to report his direction. 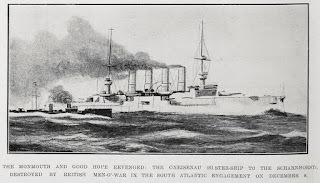 Once he heard them do this he changed course, and Scharnhorst and Gneisenau now made for Tahiti, where they bombarded Papeete and sank a French gunboat. 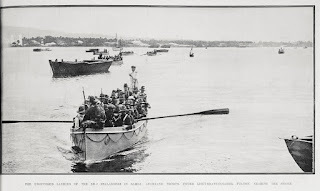 Then the German warships sailed to Nukuhiva to rendezvous with SMS Nürnberg. 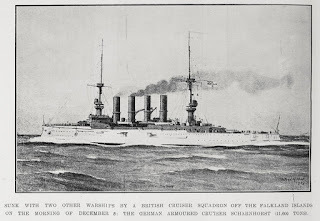 Ref: Auckland Weekly News, Raid of the German cruiser Nürnberg, 26 November 1914, Sir George Grey Special Collections, Auckland Libraries, AWNS-19141126-38-1. 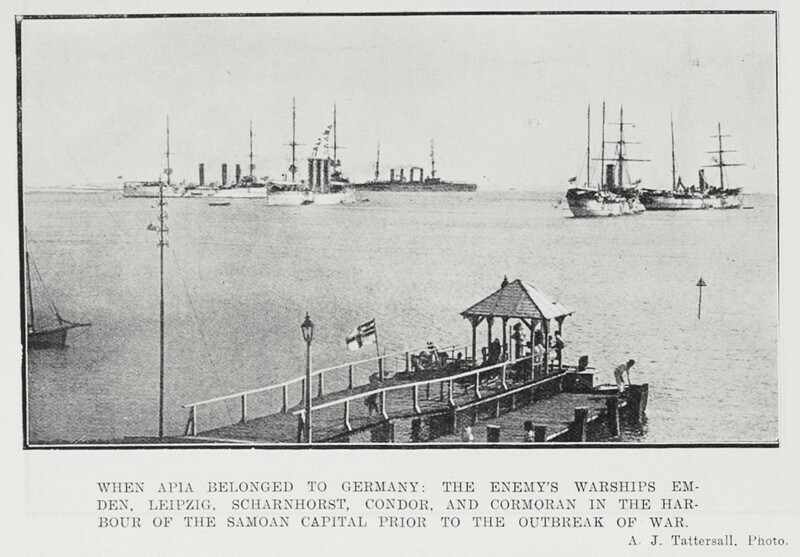 However von Spee and his fleet never returned to Samoa. Instead the three warships sailed to South America where the Germans trapped and sank two British cruisers at the Battle of Coronel off the coast of Chile on 1 November 1914. In vengeful response to this embarrassing victory, the British sent more ships to hunt the Germans down. Von Spee was cornered and at the Battle of the Falkland Islands on 8 December 1914 the Royal Navy finished off von Spee and most of the ships in his fleet. 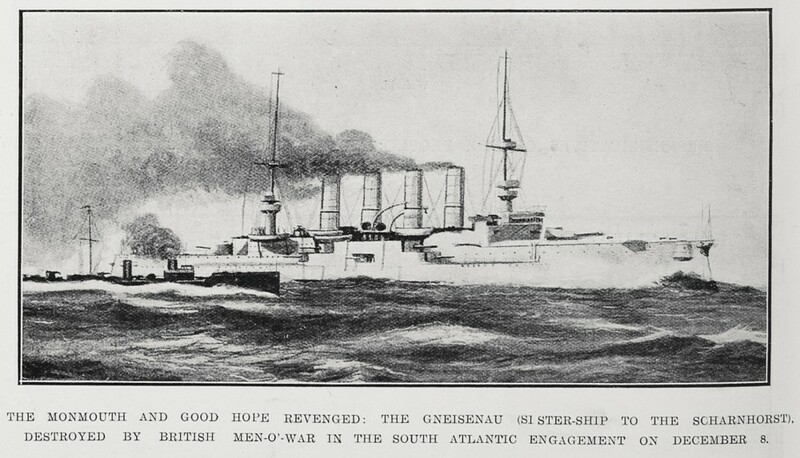 Only SMS Dresden escaped, but was later scuttled off the Juan Fernandez Islands. 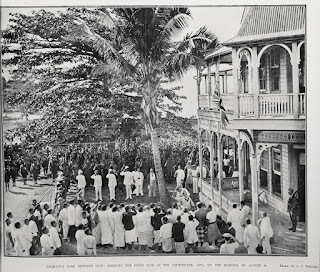 For more tales from Samoa, why not read Mau: Samoa’s Struggle for Freedom? I've just read that Ernest Shackleton left South Georgia in the Endurance on 5 December 1914. I wonder if he knew von Spee's fleet were in his vicinity?